You know when you really want something—a relationship, a new career, more fulfilling friendships—but you just can’t seem to make progress towards getting it? Do you procrastinate in one of a thousand ways? Do you focus on all the reasons why you can’t get what you want? Are you afraid to take that first step to do what it takes to get it? I’m going to tell you a story about my hiking trip to Utah this past summer, and how I learned a secret on a narrow, rocky hiking trail that helped me not only conquer trails I never thought I could climb, but also showed me how to take steps ahead in my everyday life—how to get unstuck, so I can get things done, and start moving towards getting all the things I want in my life. I was born and raised in New York City, and I’ve lived here my entire life. I’m a city girl, what can I say? I’m a lot more comfortable with concrete, tall buildings, crowds of people and lots of noise than I am with trees, lakes, mountains and quiet. My place in nature is the beach. My husband is a different story. He grew up in Minnesota, and loves the woods, lakes, mountains—and all the outdoor stuff that goes along with that. So, after many family trips over the years to European cities and beach resorts, our two most recent trips have been to Yosemite National Park in California, and to Zion and Bryce National Parks in Utah—with lots of hiking. Don’t get me wrong… I enjoy hiking so long as the trail isn’t too steep or treacherous. Before our most recent trip to Utah this past August, I even bought new hiking shoes and trekking poles. Our first day in Zion National Park was great—two short and easy hikes in the late afternoon, with gorgeous scenery. On Day 2, my husband suggested we do something more challenging. I had a feeling that this was going to be “out of my box”…but I was willing to try. Everything was fine until we rounded a curve and came to a section of the trail where we had to walk across a very narrow ledge. To the right was a vertical wall of rock. And to the left, there was a huge DROP into a deep canyon. There was no avoiding it, if we wanted to continue on the hike. When I looked off to the left into the steep canyon below I thought: “If I don’t do this right, I will fall over the edge and die.” I started to panic and wanted to turn back. I didn’t think I could do it. Those words resonated and triggered a major realization: I was in a new setting, but the feeling was old and familiar—allowing my fears to control me and stop me from moving ahead. So why was I looking down and to the left where the edge of trail fell away into the canyon, when I knew that I would be terrified of taking the next step? Why wasn’t I focused on looking straight ahead at the trail in front of me, and the very solid and safe plateau just a few steps ahead? Why? Because that has been a pattern in my life—like a deep groove worn into my brain. Too often, instead of focusing on what is in front of me, and getting things done, I obsessively ask people their opinions, to seek validation for whatever it is I am thinking or planning to do. In my mind, I need this in order to move ahead. And when I don’t get the response I want from other people, I doubt myself, re-examine my “plan” and end up stuck where I am. That day on the hiking trail, that self-doubt showed up as fear that I might fall into the canyon. At home in my everyday life, it leads to questions like: What if my friend doesn’t like the birthday gift I picked out for her? What if someone doesn’t like my coaching website? Back on the hiking trail, I knew I had to gather my courage and keep moving. So I did my best to block out the “worst case scenario” thoughts about the steep drop-off to the left, and focused straight ahead…where was I going to put my foot next? Step by step, I moved ahead until I got across what I perceived to be the “danger zone.” Once I got to the other side, I was shaking—but proud of myself. From there, we continued to the incredible “Canyon Overlook” at the end of the trail. But there was still a problem. We had to turn around and go back—which meant that I had to cross the “danger zone” all over again. But I did it. It was definitely easier (but not easy!) the second time. I kept repeating “Just look where you want to go” in my head—and that’s exactly what I did. I began to reflect on how often I get paralyzed by self-doubt, rather than looking straight ahead and trusting myself. Too often, I begin to question myself, and seek out validation from other people. And the second someone shares a negative opinion, I stop in my tracks. Inertia sets in, and I am stuck where I am. This happened when I built my website this past summer. I showed a preliminary layout to a friend, and her reaction was somewhat negative. This really threw me for a loop—even though many other people were enthusiastic with their feedback. But that one negative comment washed over me and overwhelmed the other positive feedback and my own sense that it was a great design. I couldn’t let go of it, and started to question all of the other design elements that I had previously been pretty confident about. The reality is that there will always be people that question, criticize or disagree with me and my choices. And that’s OK.
After our hiking trip, I made a promise to myself to stop asking so many other people for their opinions, and to trust myself. This was really a tough exercise for me, but I knew I had to control the impulse to doubt myself, and to learn to trust my own thoughts and ideas. Since then, I have been practicing this every day. When I feel self-doubt creeping in, and have the impulse to ask someone else’s opinion, I check in with myself first. What am I afraid of? Is it real or just in my mind? What’s my truth…whether about my website or anything else that I’m thinking or doing? Why do I want to ask this person for their opinion? Is it because I trust and value what they say? Or am I simply looking for validation from “someone” because I don’t trust myself? Is there a strong possibility that I will get a negative response that will “stop me in my tracks” and keep me from moving forward in my life? 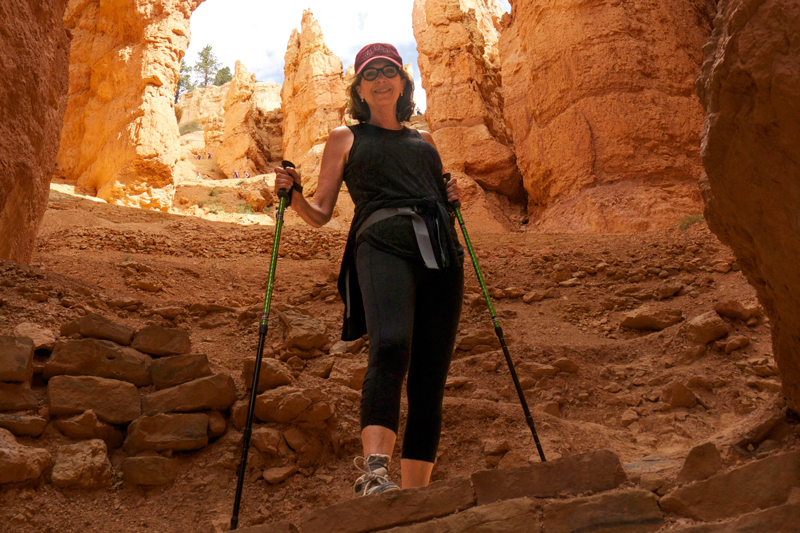 Looking back on it, what I learned out on that hiking trail—and the inner strength and confidence I gained—was a metaphor for how I want to live my life every day, and a road map for me to get the things I want. I was afraid—but I confronted it and didn’t let it stop me. And I stopped looking around me for all of the possible dangers and reasons not to move forward. If you place your mind on doubt, then doubt will take over your thoughts. Look where you want to go, not where you don’t want to go. Put your mind on what you want. Not on why you can’t get it.